In 2015, according to statistics compiled by the Global Voice on Dementia produced by the Alzheimer’s Disease International group, there were an estimated 46.8 million people worldwide living with dementia. Recent estimates for 2017 put this number closer to 50 million people. It is projected that this number will double every 20 years attaining 131.5 million people in 2050. In 2015, the worldwide estimated economic impact of dementia was roughly US$818 billion. While there are multiple pathological brain processes that can culminate in dementia, Alzheimer’s disease (AD) accounts for 60 – 80% of all dementia cases making it imperative to understand the root causes. In 1901, Alois Alzheimer observed a patient at the Frankfurt Asylum named Mrs. Auguste Deter. The 51-year-old patient had strange behavioral symptoms, including a loss of short-term memory. In April 1906, Mrs. Deter died and Alzheimer had the patient records and the brain sent to Munich. He identified amyloid plaques and neurofibrillary tangles which represented the first time the pathology and clinical symptoms of presenile dementia (later renamed Alzheimer’s Disease; AD) were presented together. Since that initial discovery, much has been gained with respect to the cellular pathologies indicative of AD. Accumulation of the beta-amyloid protein (β-amyloid, or A-beta [Aβ]) outside neurons results in the formation of amyloid plaques (protein aggregates). Aβ is formed by the sequential cleavage of amyloid precursor protein (APP) by β-secretase and γ-secretase. Cleavage of APP by β-secretase and γ-secretase releases the Aβ fragment and under suitable conditions (high concentration, oxidizing environment), begins to self-aggregate. Aβ aggregates can induce membrane lipid peroxidation (MLP), which impairs the function of membrane ion-motive ATPases (Na+ and Ca2+ pumps) and glucose transporters making neurons and synapses vulnerable to degeneration. A second pathological feature of AD occurs when tau proteins are hyperphosphorylated causing it to dissociate from microtubules. The hyperphosphorylated tau proteins accumulate in the axoplasm and eventually aggregate into paired helical filaments, coalescing to form tangles. These insoluble aggregates, called neurofibrillary tangles (NFTs), form and destabilize microtubules ultimately disrupting axon function. As the microtubules break down, axonal transport of vesicles and other organelles to the synapse becomes disrupted, leading to impaired synaptic function. While these pathological features have been intensively explored, there are newly discovered molecular processes at work that culminate in the neurodegenerative and behavioural features indicative of AD. This ebook presents these newly discovered molecular pathways that are at play during the neurodegenerative progression underlying AD. Developing an appropriate animal model of this human disease is of critical importance and the appropriate design of a valid animal model may be key in gaining a more complete understanding of the complexities of the disease process as well as in the development of therapeutics aimed at slowing, daresay, reversing the progression of the degeneration. This ebook also presents an update on the structural changes that are associated with AD pathology including synaptic and neural changes as well as alterations in lipid composition that may be a key mediating factor in the over-all deterioration of the brain. The final four chapters provide an update on how the emergence of plaques and tangles can lead to neurodegeneration with a focus on membrane breakdown, impaired intracellular transport, oxidative stress and calcium dysregulation. With a clearer picture of the molecular cascades that mediate the pathological processes associated with AD, we will be in a better position to develop more effective therapeutics in staving off this ever-increasing global disease. This will not only have beneficial outcomes at the global level but also at a more personal level enhancing quality of life for the elderly and those that take care of them. This ebook aims to update our understanding of the molecular pathology of AD in hopes of providing the foundation for an effective cure. Alzheimer's disease (AD) is the most common cause of dementia worldwide, several groups are involved in studying the predisposition and disease development sought to understand and treat all its consequences. AD is the product of the slow and progressive degenerative alteration that develops in the adult brain and can remain asymptomatic for a considerable time before the cognitive deficit becomes evident. The main challenge is to identify markers of this degenerative process, in this sense, data have been generated in the field bringing new mechanisms and hypothesis to explain its pathophysiology. This book intends to review the most recent studies in AD and get new perspectives to explain some aspects of this neurodegenerative disease. 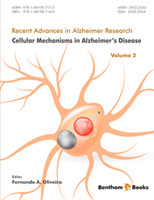 The focus of this book is to discuss the cellular mechanisms in AD including well known theories and new perspectives in the main neuronal signaling pathophysiology (β-amyloid and phosphorylate tau). Current concepts on AD will be presented, bringing the more actual information about the cellular mechanisms and new views to explain the disease progress.